Announced in May 2017, Shamu’s Happy Harbor at SeaWorld Orlando is slated to receive a major overhaul and conversion to a Sesame Street themed land. That announcement stated the new land would be completed by Fall of 2022. Based on site plans and other documents obtained from a recent public filing, it appears work could begin much sooner – as early as this year or next. 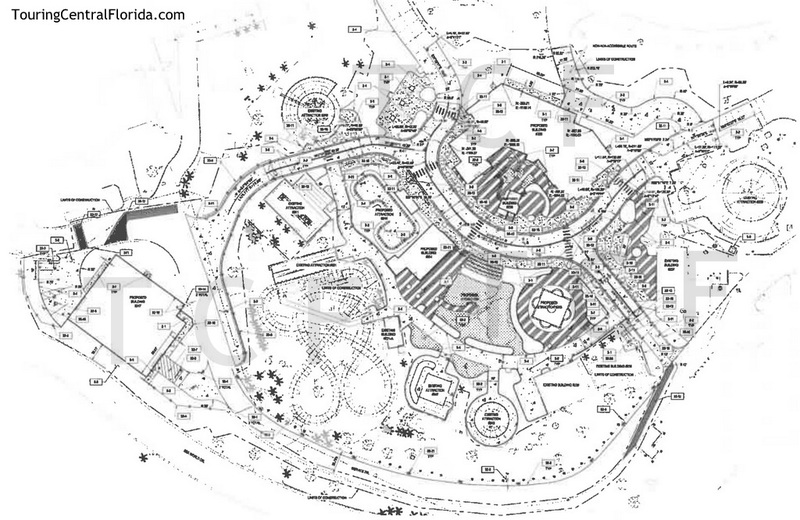 The documents show the area in question encompasses the entirety of the current Shamu’s Happy Harbor. The first image below shows the proposed project area, and the second is a closer view from Google Maps. 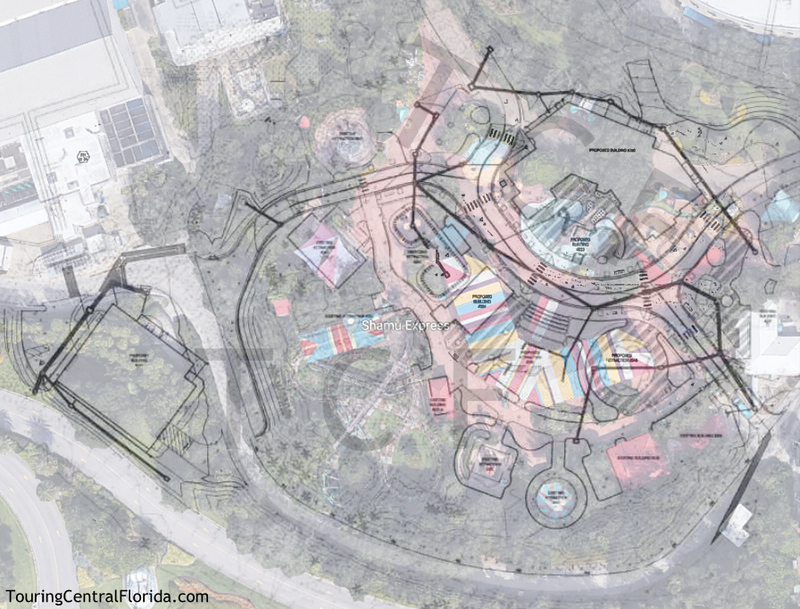 Based on site plans, attractions that will be removed as part of the renovation include the large Net Climb structure, Water Works, and Fun Ship. The Seven Seas Railway, a children’s train ride, will be relocated from its current position and will feature a reconfigured track layout when it reopens. Attractions slated to remain include Shamu Express, Flying Fiddler, Jazzy Jellies, Ocean Commotion, Sea Carousel, and Swishie Fishies. It’s highly likely each of these attractions will be rethemed and renamed to fit in with Sesame Street. Also staying put are the Baby Care, First Aid, and Restroom buildings on the east side of the area. Along with the relocated railway, it appears at least one new children’s flat ride will be installed as part of the overhaul. Plans also appear to show a second attraction of some kind, possibly a play or interaction area between the new attraction and the railway. Visible in the plans is the new pathway theming – meant to look like a real street, complete with crosswalks. With the removal of the main pathway outside of the current Happy Harbor area, all guest traffic will be directed through the new Sesame Street area. 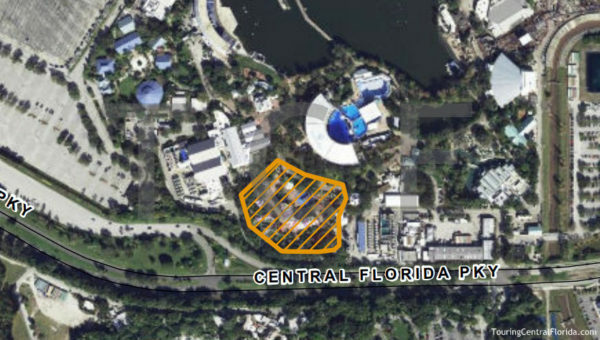 Four new buildings will be constructed, including one that will be located on a plot currently behind the scenes on the southwest side of Shamu’s Happy Harbor, bordering the entrance road into SeaWorld’s parking lot from Central Florida Parkway. That structure will be the second largest of the four noted in the plans. The largest building will be located on the north side of the area. The irregular shape of the structure suggests it could be themed to look like the buildings on Sesame Street. 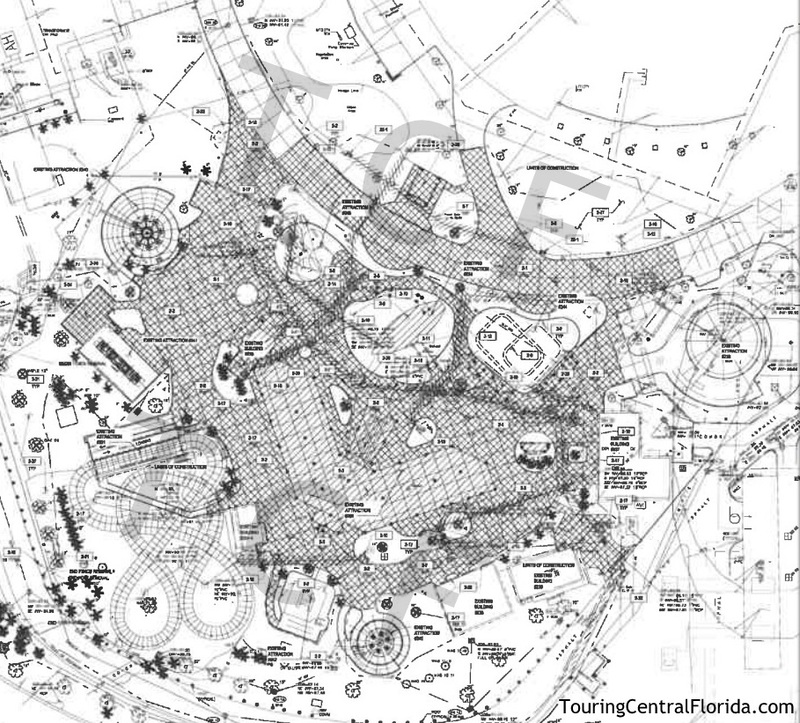 Site plans do not specify the use of the buildings, which could house an attraction, show, or dining area. 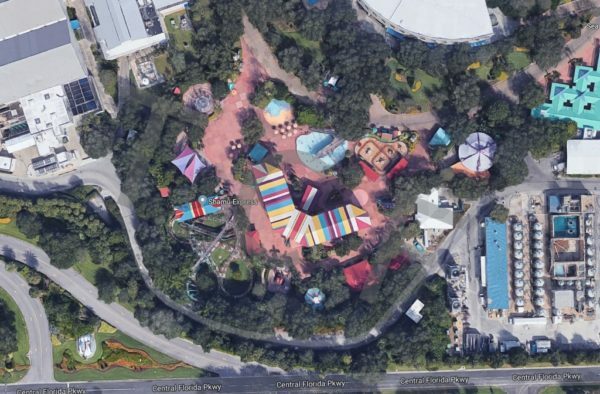 Part of the announcement in 2017 mentioned the possibility of a parade; it’s possible the new structure on the southwest corner of the project area will remain behind the scenes and be used for storage of parade elements. The two smaller buildings will likely house concessions or other support services. The overlay below shows the plans lined up with the current satellite image. In the overlay image below, the new buildings are outlined in orange. 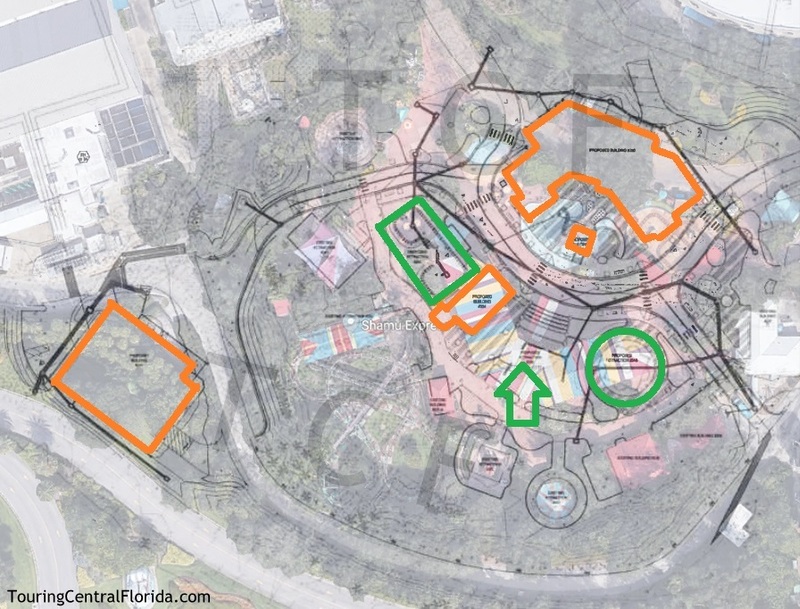 The green circle is the new flat ride, the green rectangle is the relocated railway, and the the green arrow points to the possible play/interaction area. Since no official announcement has been made, and plans can and do often change, the above information is unofficial and should be considered speculation only at this point. 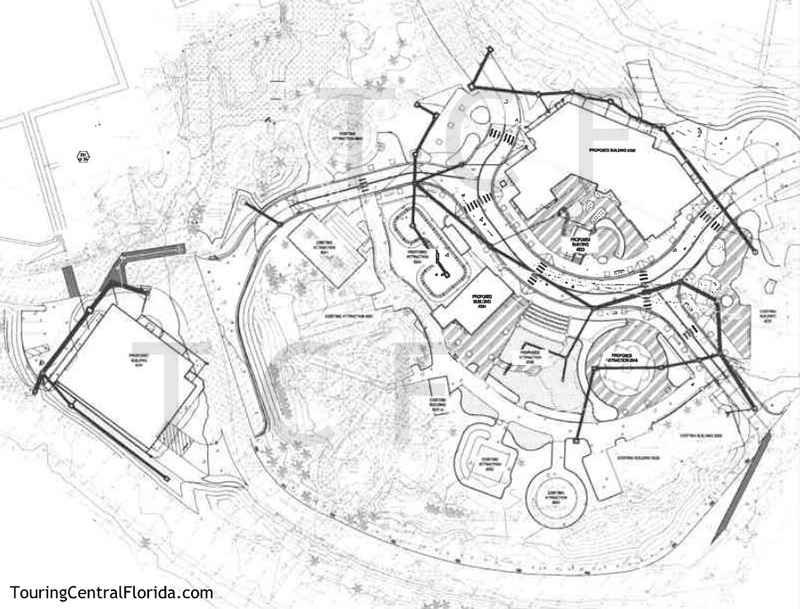 But based on these documents obtained from a government organization publication, it’s obvious plans for the new Sesame Street themed area have progressed well beyond the rough idea stage it was at when announced in May 2017. It’s unclear at this point if the entire area would close for the overhaul or if construction would be done in phases. For the latest on SeaWorld Orlando and other theme parks, attractions, dining venues and more across the region, be sure to follow Touring Central Florida on twitter @TourCentralFL & @androckb, and give our facebook page a like.